Dominican College is located 15 miles northwest of New York City. The college offers Bachelor of Science programs in Accounting, Computer Information Systems (CIS), and Management programs. Each course consists of various types of units and the final project. The College has three campuses: North Campus offers computing programs; South Campus offers Accounting Programs; West Campus offers Management Programs. There are lecturers who are capable of teaching various types of units of programs offered by the College. However, the Academic Manger allocates units for all the lecturers based on their skills and competencies. When the students are registered for the course, the admin of the College assigns appropriate course for each learner. Once the course is assigned, students are able to find out the lecturers those who deliver the respective units and the campus, which they need to attend classes. Task 1: You are required to carry out research by using supportive materials like books, websites, etc., and give a feedback of the findings on A.C 1.1, A.C1.2, and A.C1.3. The answers need to be reflected to the general Data Analysis and Design Concepts. You are required to select any organization to identify and understand how database models and database technologies have been implemented with their business processes. Answers without application to an organization or without examples will be marked as Resubmission. Task 2: You are required to carry out research by using supportive materials like books, websites, etc., and give a feedback of the findings on A.C2.1, A.C2.2, and A.C 2.3. The answers need to be reflected to the given case study above. Answers without application to the given case study organization or without examples will be marked as Resubmission. A.C.2.1 Design a relational database system to meet a given requirements provided in the given case study. A.C.2.2- Build a relational database system for the database design in A.C 2.1 using an appropriate database software application. 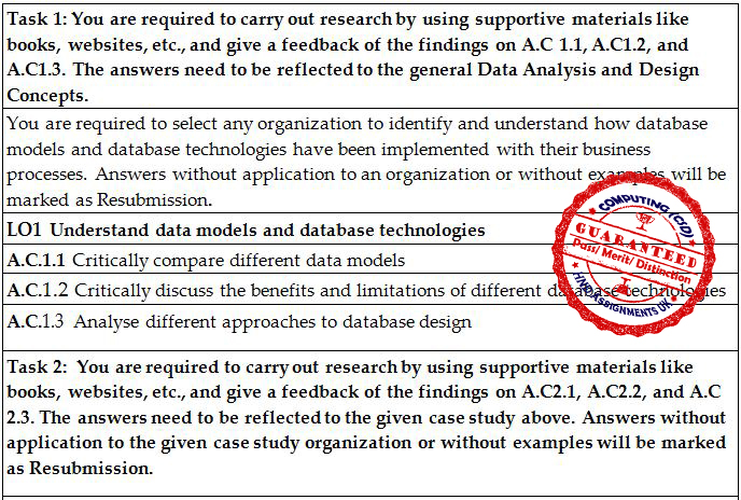 A.C.2.3 Apply a range of database tools and techniques to enhance the user interface to meet the given case study requirements. Task 3: You are required to carry out research by using supportive materials like books, websites, etc., and give a feedback of the findings on A.C 3.1, A.C 3.2, A.C 3.3. The answers need to be reflected to the case study given above. Answers without application to the given case study organization or without examples will be marked as Resubmission. A.C. 3.1 Explain the benefits of using manipulation and query tools in a relational database system as per the requirments given in the case study. A.C. 3.3 Critically evaluate how meaningful data has been extracted through the use of query tools for the given case study. Task 4: You are required to carry out research by using supportive materials like books, websites, etc., and give a feedback of the findings on A.C 4.1, A.C 4.2, A.C 4.3, A.C 4.4 and A.C 4.5. The answers need to be reflected on the case study given above. Answers without application to the given case study organization or without examples will be marked as Resubmission. A.C. 4.4 Explain how verification and validation has been addressed in the developed relational database system. A.C. 4.5 Explain how control mechanisms have been used in the developed relational database system.